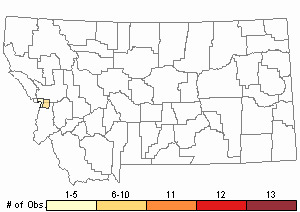 Montana endemic restricted to a very small area of the Bitterroot Mountains with only a few known occurrences. All occurrences are in the Selway-Bitterroot Wilderness. However, activity related to hiking trails and a lookout tower may adversely impact P. humilis plants or its habitat. Score2 - Small: Generally 2,000-10,000 individuals. Score3 - Very Low: Generally occurring in 3 or fewer Subwatersheds (6th Code HUC’s). Score1-2 - Moderate to High. CommentAlpine species whose habitat does not appear to be highly restricted, but may need specific geologic or edaphic conditions of limited distribution. ScoreNA - Rank factor not assessed. 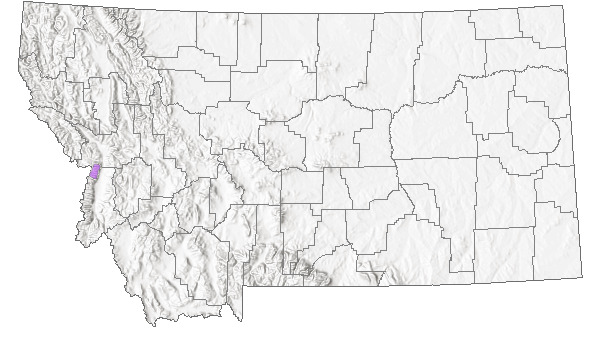 CommentTrends are unknown, though there is no indication that the species' has experienced significant declines in Montana and the habitat is stable. Score2 - High: 31-70% of the populations are being negatively impacted or are likely to be impacted by one or more activities or agents, which are expected to result in decreased populations and/or habitat quality and/or quantity. CommentTrampling from recreational activity, activity related to fire lookout tower. Score1 - Moderate Vulnerability: Specific biological attributes, unusual life history characteristics or limited reproductive potential makes the species susceptible to extirpation from stochastic events or other adverse impacts to its habitat and slow to recover. Score 12 to 13 total points scored out of a possible 19. Bitterroot Bladderpod is a small, low perennial with 1 to several unbranched stems that are 2-5 cm long and arising from a simple taproot covered with old leaf bases. The basal leaves are 2-5 cm long and have entire-margined, ovate or elliptic blades and a long, narrow petiole. The 3-6 stem leaves are spoon-shaped and 3-7 mm long. The herbage is silvery with a dense covering of appressed, branched hairs. The small, terminal inflorescence is 3-5 flowered, and the four yellow petals are 7-9 mm long. The compressed fruits, or siliques are 3-4 mm long, and wider than they are long. Flowering in late June-August, fruiting in July-August. Physaria humilis could be confused with Physaria geyeri, as well with as other members of the genus. The alpine habitat is probably the best distinguishing character. Physaria humilis can be distinguished from other alpine species in the mustard family by the compressed fruits that are wider than they are long. 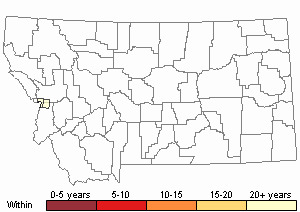 Endemic to Ravalli County, Montana. Rocky, granite-derived soil on open slopes, primarily in the subalpine and alpine zones. Achuff, P.L. and J.S. Shelly. 1990. Report on the conservation status of Lesquerella humilis, a candidate threatened species. Unpublished report to the U.S. Fish and Wildlife Service. Montana Natural Heritage Program, Helena, Montana. 37 pp. Al-Shehbaz, I. A. and S. L. O'Kane. 2002. Lesquerella is united with Physaria (Brassicaceae). Novon 12:319-329. Lackschewitz, K. 1991. Vascular plants of west-central Montana--identification guidebook. U.S. Forest Service Intermountain Research Station, Ogden, UT. 648 pp. Rollins, R. C. 1984. Studies in the Cruciferae of western North America II. Contributions Gray Herbarium 214:1-18. Shelly, J.S. 1988. Status review of Lesquerella humilis, United States Forest Service, Region 1, Bitterroot National Forest. Unpublished report to Bitterroot National Forest. Montana Natural Heritage Program, Helena. 30 pp. 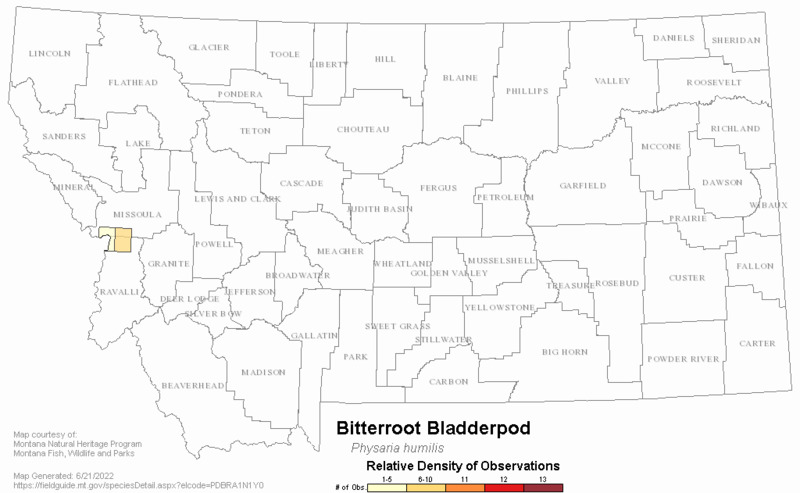 Web Search Engines for Articles on "Bitterroot Bladderpod"